October 8th- 14th marks Mental Health Awareness Week. Co-op farmer Wayne Langford knows what it’s like to suffer from mental illness. He’s the man behind the YOLO (You Only Live Once) farmer blog. He shares his story about owning up to his illness and how the YOLO project helped him cope with depression. Most people who knew Wayne Langford knew this about him. He was 34, married to his wife Tyler and the father of three boys. He was a 6th generation dairy farmer who owned and ran his Golden Bay farm. He was a proud Fonterra supplier and was the Federated Farmers Dairy Vice Chairman. . .
New Zealand trade negotiators are trying to get their European counterparts to recognise Kiwi agricultural exports are small-fry in comparison to the regional bloc’s farming sector. The second round of free-trade negotiations between NZ and the European Union is under way in Wellington with 31 European officials in the capital to discuss a deal politicians say they’re keen to fast-track. . .
An innovative approach to monitoring farm effluent runoff is reaping financial rewards for farmers with bonuses for farming excellence. Miraka, a Taupo-based milk processor with more than 100 suppliers, is offering bonuses to farmers who meet the five criteria set out in its Te Ara Miraka Farming Excellence programme – people, the environment, animal welfare, milk quality and prosperity. . . Despite the fact they are not out of the woods yet, cattle farmers are starting to consider life after Mycoplasma bovis. Finding that pathway will be helped by a special Beyond Bovis seminar in Hamilton later this month – held in conjunction with the Waikato A&P Show. The government is working to eradicate M bovis and so far more than 43,000 cows have been culled. . . There is a shortage of young people wishing to work in the agriculture sectors, and industry consultant John Bates, of Alexandra, is developing a programme to help address the problem. Lincoln University owns Mt Grand, a 2127ha high country station near Lake Hawea. Profits from the farm help fund postgraduate and graduate scholarships. It is also a teaching facility for university students studying environmental and ecological degrees. . .
(BusinessDesk) – PGG Wrightson expects full-year operating earnings to be on par with last year’s record, including earnings from the seed and grain business that it is selling to Danish cooperative DLF Seeds. The company said it expects its operating earnings before interest, tax, depreciation and amortisation to June 30, will be approximately $70 million. In August, it said its operating ebitda was a record $70.2 million in the year ended June. . . Weeks out from its breakup with Air New Zealand, Virgin Australia says it ready to roll out its “full armoury” in what is shaping up as a three-way battle over the Tasman. The Australian airline is also trying to establish more of a market presence here after being quiet for much of the alliance with Air New Zealand that stretched more than six years but will end on October 28 after the Kiwi carrier opted to quit the partnership. Virgin has since upped its marketing and following a search for a New Zealand beef supplier the airline today announced Hinterland Foods from Moawhango in the Rangitikei District had won the “Got Beef” campaign and would supply its meat to the airline for in-flight meals. . .
A beauty, a brainwave, a brilliance? I couldn’t find a collective noun for books, but any and all of those three would be an appropriate one for A Kaleidoscope of Butterflies by Kate Hursthouse. The seed for the book was planted during a conversation about zebras in which she was told the collective noun for the animals is a dazzle. The seed grew and blossomed into a book of collective nouns for animals, beautifully and creatively illustrated with pictures which reflect the words. Each time I open the book I see something more. It is described as a children’s book but will interest and delight adults too. You can buy the book from the artist’s website. 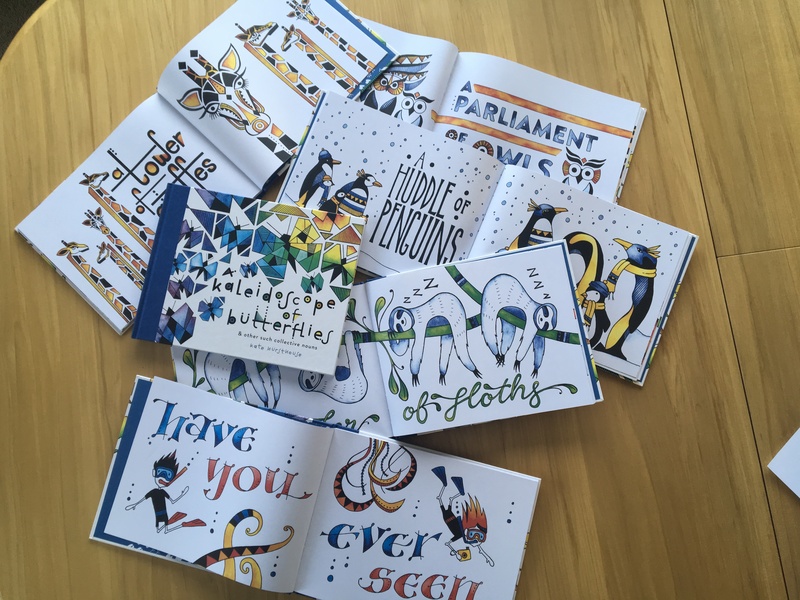 There’s more about the artist and the book at: Renaissance artist – the Aucklander helping keep alive age-old art of calligraphy. Terry Copeland says he is looking forward to his new challenge. The New Zealand Young Farmers (NZYF) chief executive is set to take over as Federated Farmers’ new boss next month and admits dealing with the ongoing impact of the Mycoplasma bovis outbreak will be a ”baptism of fire”. ”I’ve got a real passion for wellness and mental health and I plan to bring that to my new role. ”Through the fallout from Mycoplasma bovis there will be a lot of communities in severe crisis, so making sure communities are supported will be hugely important . .
A farmer way up the Waitōtara Valley plans to get carbon credits from his poplars and is planting mānuka and using cattle to open up the ground for regenerating native bush. Diversifying appeals to Roger Pearce, who has been farming in Makakaho Rd for four years. His land is becoming a patchwork of bush, closely planted poplars, mānuka, pasture and green feed crops. “I like the idea, and the overall picture, where it’s going for the long term – not just intensively farming livestock,” he said . . Farmers are being warned the meat industry they could go the same way as the wool industry if they ignore the threat of synthetic proteins. The warning comes in the Hawke’s Bay Farming Benchmarking Review by accounting and advisory firm Crowe Horwath which saids repeated failure of the wool industry to respond to the threat of synthetic fibres was a “clear and serious warning” of potential problems in the red-meat sector. . .
Fonterra’s performance since formation in 2001, especially since listing in late 2012, has been the subject of much discussion around farm house kitchen tables, in supplier meetings in country halls, among Wellington regulators and in the media. More than 10,000 supplying shareholders and several hundred investors in the Fonterra Shareholders’ Fund (FSF) have views on the giant’s performance ranging from laudatory to sceptical to dismissive. Farmers Weekly has printed a range of views in a series called Fonterra’s Scorecard preparatory to the Government’s review of the dairy industry by the Ministry for Primary Industries this year. Some conclusions are summarised here under subject headings and the report card is mixed. . . The drought has its claws into the Peters farm after a run of good seasons but that does not make it any easier to manage while keeping yourself on top in the head department. In the last few years we had started on some long overdue capital improvements that now will have to be put on hold but the shock has been the rapid onset and time of year that has made the impact so severe. My farm includes part of Wallangra Station that has some 120 years of rainfall records so it is interesting to look back on that admittedly short history to see what has happened. When looking at the November to April rainfall there are five standout crook times: 1902, 1919, 1965, 2007 and now this year. . .
Eastern Australia is in another major drought and the cattle industry is in big trouble. Mal Peters’ outstanding May column was a poignant description of what most cattlemen are enduring – very expensive or no feed, declining or no water and big price falls. The stress is exacerbated by Indian and American inroads into our export markets and chicken into our domestic market. Drought is part of Australia’s DNA. No-one can predict when it will come to an area or when it will break. Talk of more money for weather forecasters to tell farmers when to plant their crops is Disneyland stuff-the next fortnight is all they can predict with any accuracy. . .
A group of North Otago farmers are working together to find ways to increase profitability, taking advantage of the support offered by the Red Meat Profit Partnership’s Action Network initiative. Tony Benny reports. Ross and Jo Hay and their friends Gareth and Sarah Isbister got a taste for working with experts and getting access to the latest research and information when they joined the Red Meat Profit Partnership’s pilot farm programme. They were part of RMPP partner Silver Fern Farms’ red meat eating quality project, looking for ways to consistently produce the most succulent, best tasting, and most valuable lamb. For about a year they talked about how valuable it would be to form a farmers’ group that “really crunched into life”, that drilled down into financials and objectively analysed their respective businesses. When they went to an RMPP workshop in Christchurch, they found what they were looking for. “We heard Richmond Beetham from Baker Ag talking about the business groups they have running in the Wairarapa and we were like, ‘That’s what we want to do’,” recalls Jo Hay. . . The former registered valuers won the ultimate award – 2018 NZ Share Farmers of the Year. They say the way dairy farmers interact with each other is fantastic. “Look at the discussion groups and how willing people are to share what they are doing,” Dan told Dairy News. . .
(BusinessDesk) – South Island dairy processors Synlait Milk and Westland Milk Products have raised their forecast milk payment levels to their farmer suppliers for the upcoming season, following a similar move last month by larger rival Fonterra Cooperative Group. Rakaia-based Synlait raised its forecast milk price for the 2017/18 season which officially ended yesterday to $6.65 per kilogram of milk solids, and said the average premium payment of 13 cents would lift the total payout to $6.78/kgMS. It announced an opening price forecast for 2018/19 of $7/kgMS, based on milk fat prices remaining firm throughout the season. “He takes a systems approach to the way he manages the farm and has good systems in place to ensure nothing gets through the gaps. . .
An upcoming conference in Auckland on alternative proteins offering consumers new food choices will include a debate on whether new plant-based proteins will disrupt traditional meat producers’ markets or simply bring more cheaper food choices to the masses. Last week in Britain, ahead of expectations, Tesco and Dutch-based plant food company Vivera jointly announced the immediate stocking of 100% plant-based steaks on supermarket shelves there. . .
His journey, to what was meant to be a better life, was not an easy one: . .
One of the first large-scale commercial avocado orchards to be planted in New Zealand – as part of a multi-national growing consortium – has been placed on the market for sale. The 29 hectare property at Awanui just north of Kaitaia was originally established by Californian-based owners in 1990. It was planted with Hass on Zutano and Duke 7 avocado varieties grown on some 20 hectares of plantation land. . .